The Springfield Motorcycle Show is a high-end, top shelf motorcycle event that brings together bike builders, manufacturers, and retailers in a rocking atmosphere that delivers fun and enjoyment for the whole family! This two day mega event is the ultimate one-stop shopping experience for motorcycle enthusiasts. Congratulations to our 2019 BIKE SHOW WINNERS! Thanks to everyone for another great year. We look forward to seeing you at next year’s motorcycle show! Look who’s riding into the Springfield Motorcycle Show! That’s right, back by popular demand we have none other than the living legend himself. 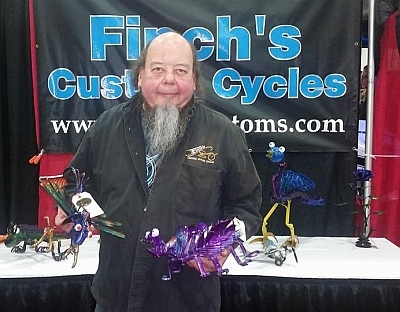 We are so excited to have Motorcycle Master Ron Finch back at the Springfield Motorcycle Show. 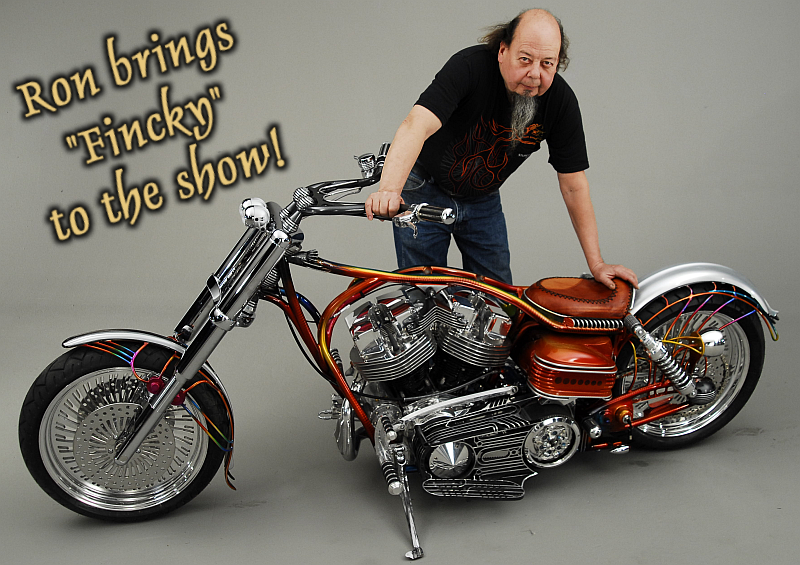 For over 45 years, Ron has been building some of the worlds greatest and most artistic custom motorcycles! With limitless creativity and a keen eye for turning metal into fine art, Ron is known throughout the world as one of the very best. His creations have been featured in hundreds of magazines, several art museums and at motorcycle shows around the world. Ron’s latest creative outlet is a style of art he calls METALife. 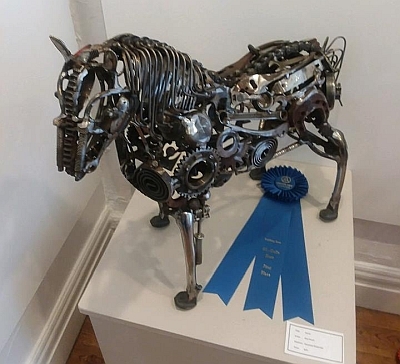 You will be amazed by these Incredible metal sculptures that only the creative master himself could dream up down at the show. Ron has been seen on TV during Discovery Channel's "Biker Build Off." He’s also been on the Speed Channel, National Geographic, the Travel Channel and TLC. 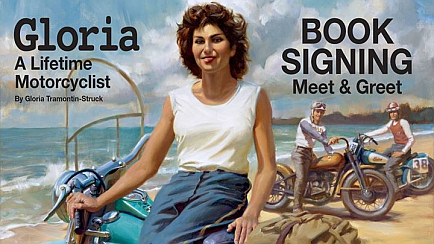 This is your chance to come and meet this legend of the custom motorcycle world! Ron Finch & Sturgis Hall of Fame! 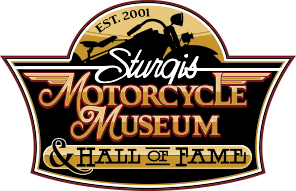 The Sturgis Motorcycle Museum & Hall of Fame recognizes individuals or groups who have made a long-term, positive impact on the motorcycle community by inducting them into their Hall of Fame. Ron Finch will be inducted into the Sturgis Hall Of Fame on August 7, 2019! Congratulations to Ron - it is an honor you deserve! Everyone, save the date, go, and see for yourself! This year, our Feature Builder is Larry Vaughn. 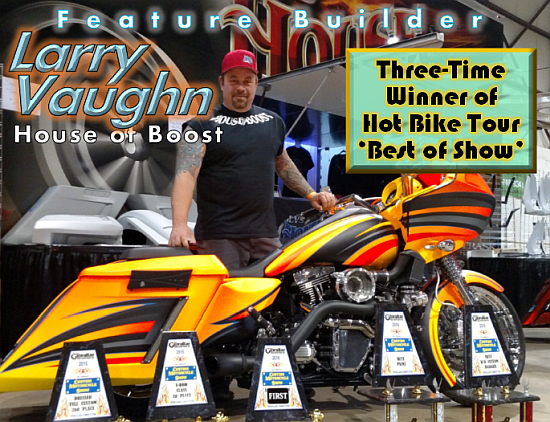 Larry is a well recognized expert in the motorcycle industry and we are excited to have this master craftsman and Three-Time Hot Bike Tour Winner with us at the show! Larry specializes in Harley-Davidson Turbo Chargers and all things Harley. Larry is featured in Easy Rider, Hot Bike, American Iron, and Baggers Magazine to name a few of the accolades he has received. 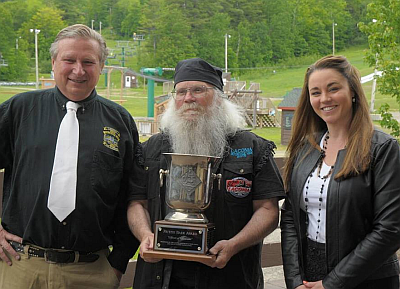 Larry is also the proud owner of a slew of awards and trophies he’s picked up at motorcycle shows around the country. In addition to entering bike shows, Larry also has time to run a full service shop that offers performance enhancements, turbocharger installs, and customization on Harley-Davidson motorcycles. Come down to the show and meet Larry Vaughn in person and check out his latest builds. Hall of Fame Inductee, Book Author, and Rider at 92 Years Young! Gloria Struck epitomizes that age is just a number. 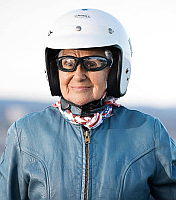 This feisty lady began riding motorcycles way back in 1941. 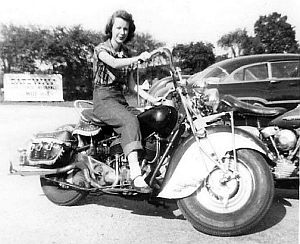 She was only 16 at the time and with that first ride, she was hooked. The trill, adventure, and freedom that motorcycle riding provides is something that riders can relate to everywhere. 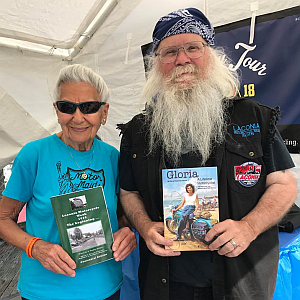 Now Gloria, a Motorcycle Hall of Fame inductee, has completed her first book titled, “Gloria – A Lifetime Motorcyclist: 75 Years on Two Wheels and Still Riding.” Come to the book signing meet and greet and get to know this special lady! We are thrilled to have Biker Poet, K. Peddlar Bridges back with us at the show. He is the recent winner of the Fritzie Baer Award. Congratulations Peddlar! You earned it. Have you seen his recent article in Connecticut Cruise News? It is all about Gloria Struck. It is well worth seeking out to read before coming to the show.. Pick up the December 2018 edition and check out the Road Poet’s Page. Here is a recent picture of Peddlar and Gloria Struck from Laconia 2018. Photo by Lori Struck Desilva. You get to meet both of these incredible authors at the show! You’ll find Peddlar on the Main Stage reading original works as well as meeting with the folks and sharing motorcycle info, history, and stories. Peddlar is a wealth of knowledge when it comes to motorcycle history. 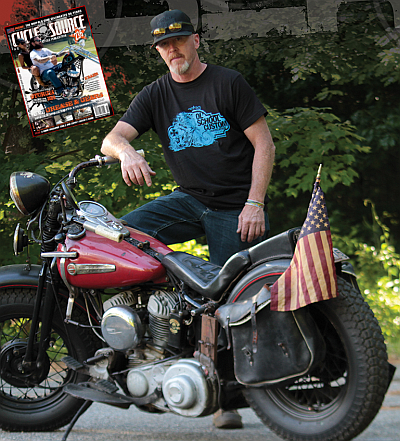 Be sure to get his book “Laconia Motorcycle Week 1916 – The Beginning,” while at the show. It will be available for purchase and signing. It is filled with Laconia history as well as stories of his personal experiences through the years. Extraordinary photography is what every great builder seeks out. Great photography elevates even the most highly crafted custom motorcycle to an even higher level. This expertise and visual talent is reflected in every image Larry Cahill takes and it is why we have selected him to be our Featured Artist at the show. 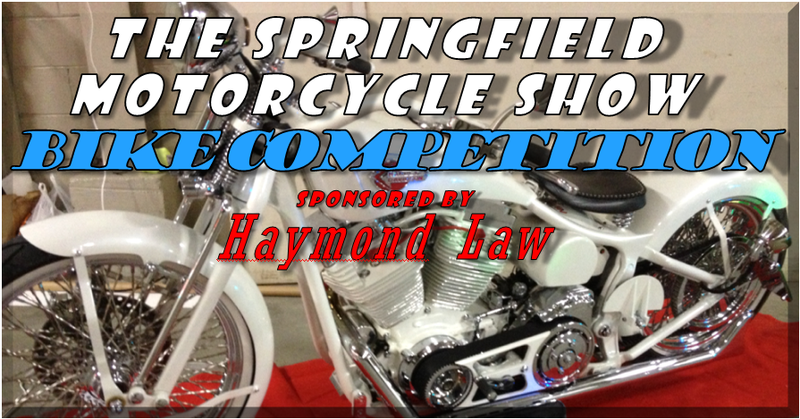 Sponsored by the Haymond Law Firm, the SMS motorcycle competition draws expert builders from every corner of New England and beyond. It is the cornerstone event at the show and a fan favorite. Each year, the fans come to see all the custom bikes and meet the builders. These show attendees can participate in the competition and determine the outcome of the people’s choice award. In addition, there is the prestigious judges’ choice award in the competition and many trophy categories along with a group of special recognition awards. From chopper to street cruiser, the motorcycle competition has something for everyone. It’s time to get your entry form and join in this time honored tradition that takes place in the Young Building. Rob Lations from Ol’ School Custom Fabrication will be with us at the show. We are excited to have Rob as a Featured Builder this year. You may have seen Rob Lations in Cycle Source Magazine. 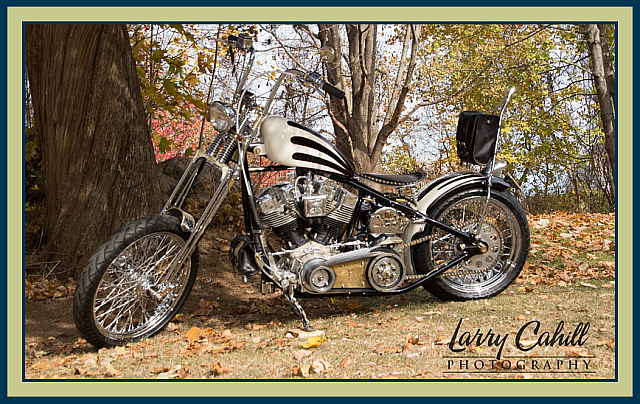 He Harley-Davidson deamed, “The Liberator,” was featured in the November 2016 Issue of the magazine. He has many other great builds as well. Come down to the show and check out some of his latest work. It will be easy to see why we have selected Rob Lations to be one of our Featured Builders at this year’s motorcycle show. Outreach specialists with the Veterans Health Administration, representing VA medical centers in central and western Massachusetts, as well as the Springfield Vet Center, which offers readjustment counseling for Veterans, will be in attendance. 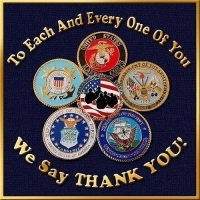 Eligible Veterans can sign up for VA health care at the show. 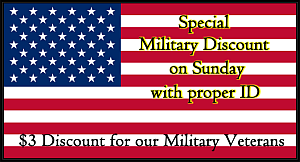 As a thank you to all those that have served, we will have a special $3 Military Discount at the motorcycle show on Sunday for those with proper Military ID, good for $3 off one entry. 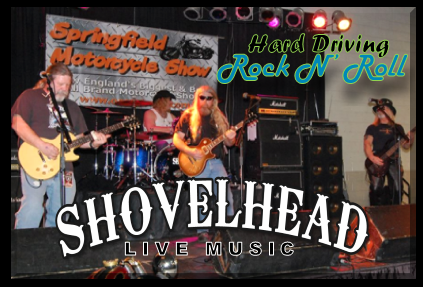 SHOVELHEAD keeps the show rocking all weekend long! They are not the only entertainment that is lined up for the weekend. There will be things happening on the Main Stage all the way up to the annual Awards Ceremony. Don’t miss out on any of the action. Everyone loves to find out who won the Bike Competition. 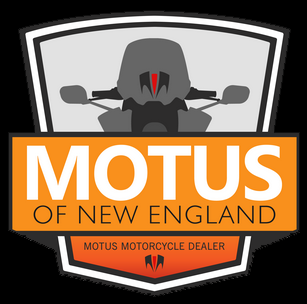 It is going to be another great year filled with spectacular motorcycles from all around New England, so be sure to watch this years awards ceremony at the end of the show! 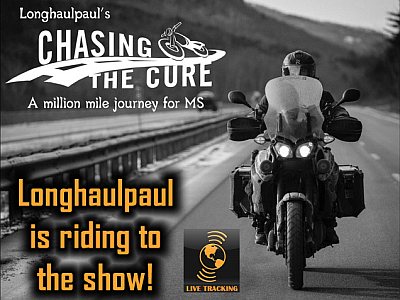 That’s right, Longhaulpaul is riding into the Springfield Motorcycle show and he’ll be making personal appearances on both days to greet fans and talk about his Million Mile Journey. As of December 2018, he has documented 350,000 miles across 49 states, speaking at over 250 events all while raising awareness and over $150,000 for Multiple Sclerosis! You’ll find Longhaulpaul at the MOTUS display booth. Did you know they broke the land speed record to become the fastest American made production motorcycle? Get all the details and find out the latest that MOTUS has to offer at the show. 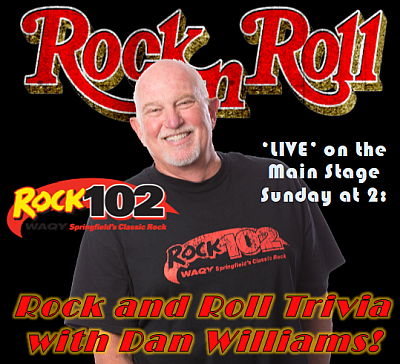 Rock 102 will be at the show from 1pm to 3pm and Dan Williams will hit the Main Stage at 2pm for a Special Rock and Roll Trivia Contest that you can participate in! The contest is all about having some fun while at the show, so get your trivia sheets at the Rock 102 booth before 2:00. At the start of the contest, Dan will read the questions and have people fill out the answers. After all the questions have been asked, participants can hand their sheets back in at the Rock 102 booth for a tally. Are you an expert at Rock and Roll Trivia? PROVE IT! One winner will be chosen and receive a Grand Prize (TBD) provided by Rock 102. Show Trophies will also be given to the Top Three contestants, so be sure to join in the fun on Sunday! The photo to the left is a replica of an 1867 Roper steam powered bike. This museum quality replica was manufactured by Bill Eggers, owner and CEO of William Eggers Motorcycles. You can see this incredible recreation down at the show. In 1867, Sylvester Howard Roper created the bike that would lead to the creation of the motorcycles we are familiar with today. His all new form of transportation was the first of it’s kind, a motorized bike. This fascinating creation was powered by steam! Although the use of steam engines did not catch on, Sylvester Howard Roper was an engineering pioneer. Soon after his introduction of the 1867 Roper Steam Velocipede, others were inspired to work on similar “motor” projects. The most well regarded was the development of the 1885 Daimler Reitwagen. 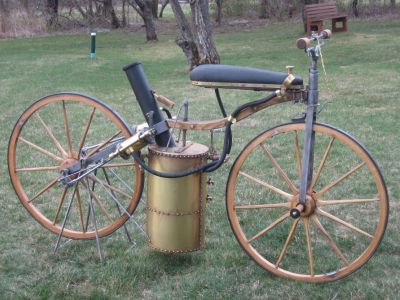 This was the first gas powered motorcycle. 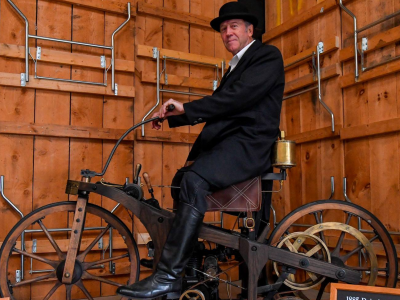 Bill Eggers created a museum quality replica of this early mode of transportation as well. A Roper, a Daimler, and many other early forms of transportation have all been reproduced by Eggers. When it comes to replicas, Bill Eggers is the master. His handiwork can be found in museums throughout the country. So, take a moment and visit Bill Eggers while at the show. It will be like stepping back in time. ‘Hermis Yanis, sidekick Kenny Lavoie and film crew will be shooting live at the show. 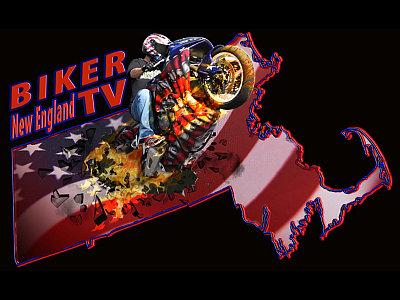 Stop by and watch Biker New England TV Interview the great exhibitors and customers of the Springfield Motorcycle Show! 7 Hawks Media has produced over 300 TV shows on WCCA TV, and Charter Communications TV3, 440 radio shows on WORC 1310AM, WCUW FM, 50,000 watt WCRN 830AM, and online at Blog Talk Radio. 7 Hawks Media has filmed and, produced/co-produced several prominent and world class events including NASCAR racing, professional boxing, car shows, motorcycle shows sporting events and private functions. 7 Hawks Media is proud to have been selected as the Official video production company for the 50th Anniversary of Congregation Beth Israel in Worcester. The Yankee Chapter of the AMCA returns to the motorcycle show with their latest display of antique motorcycles. The AMCA defines an antique as at least 35 years old. Be sure to stop by the Antique Motorcycle Club of America booth and see their members’ vintage rides and learn more about their organization and what they do throughout the year. If you are wondering what types of motorcycles you might see on display, just take a look at these bikes from the club. 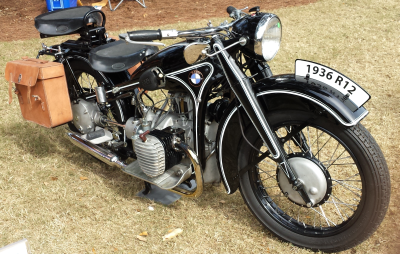 The oldest is a 1936 BMW R12 Sport Touring version! This is the first production motorcycle to be equipped with hydraulically dampened front forks. The 750 cc engine utilizes magneto ignition and is configured with twin carbs. Most R12s have a single carb engine that puts out 18 HP. This twin carb sport version engine puts out an outrageous 20 HP. This R12 has won awards at the Greenwich Concours dElegance and the Hilton Head Island Concours. 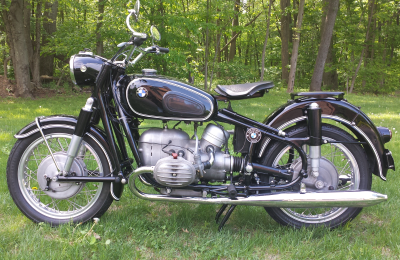 Another impressive bike is a Model 1955 R50 (1956 production year). This is the first production motorcycle to be equipped with swing arm (Earls) front forks. This R50 has won Best in Class at both Greenwich and Hilton Head. The AMCA has judged this to be a 100 point bike. The Vintage BMW Club rates it over 99 points. So if you have a passion for older model motorcycles, be sure to stop by the Yankee Chapter of the AMCA’s booth while you are down at the show and see their impressive display of antique motorcycles. A crowd favorite for the movie buffs. 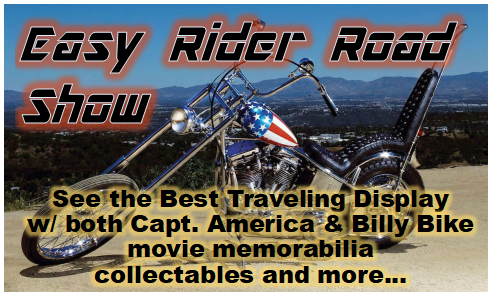 The Easy Rider Traveling Road Show is special display that has both a Captain America and Billy bike. These two classics styles of old school motorcycles were made famous during the cult classic film, Easy Rider. Come see the bikes along with a huge collection of movie memorabilia. These are just a few highlights of what you might see at a SMS show. Mark your calendar for January 18-19th, 2020 at the Eastern States Exposition, 1305 Memorial Avenue, West Springfield. You know the place, it’s the Home of the “Big E” It is going to be a great weekend filled with fun and excitement. See you there!